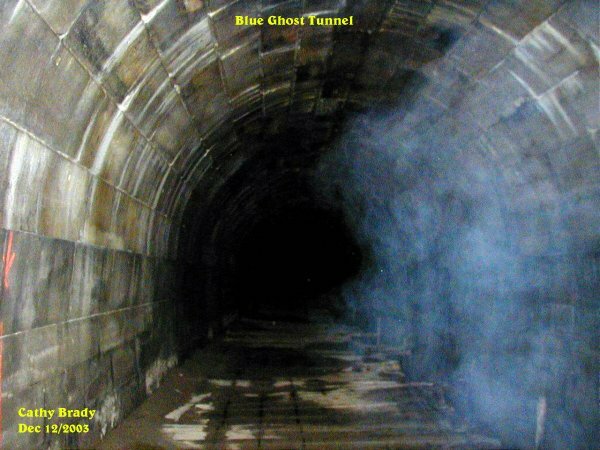 We headed out for the Blue Ghost Tunnel. It has been a while since we were out there last and with the weather being fairly good we thought we would re-investigate the tunnel once again. Upon our arrival at the tunnel it seemed very strange to be back , but there was also a feeling of being watched within the tunnel itself. 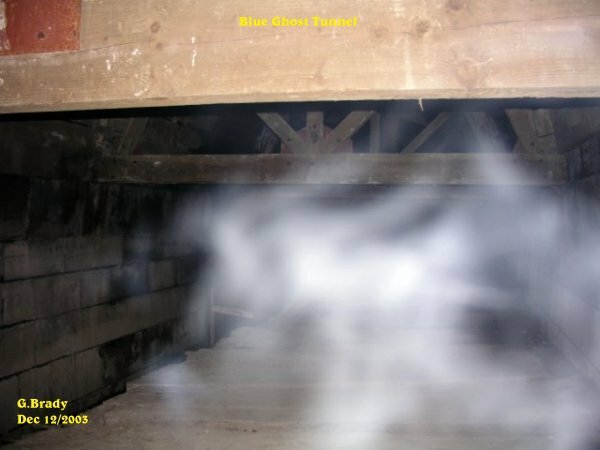 When we got inside it gave all of us an eerie feeling as we had approached the support beams inside. 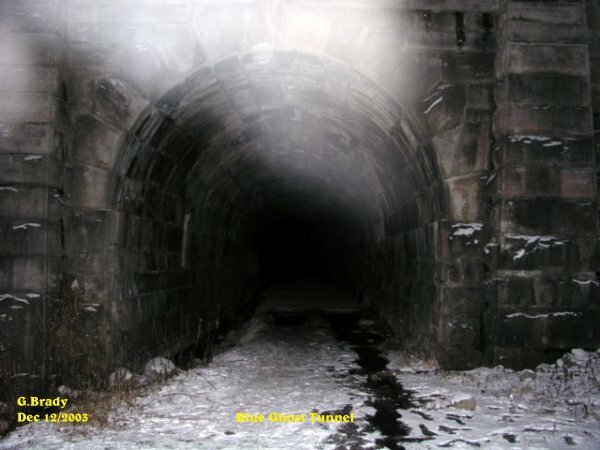 We all heard what seemed like someone walking at the far end of the tunnel and the footsteps seemed to get closer to us then it would move back. We all had a sense that we would get some good shots inside the tunnel this night. 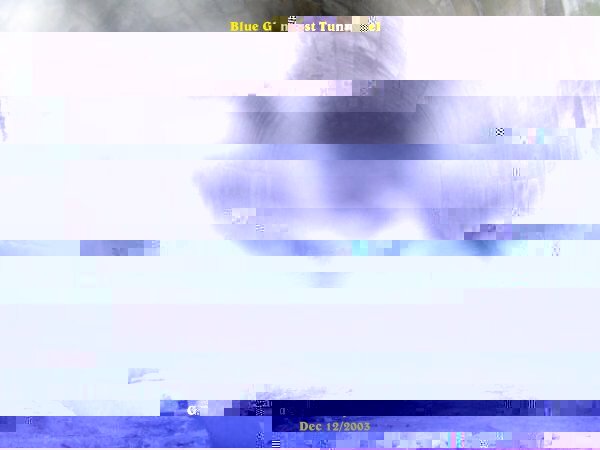 After taking some pictures inside the tunnel I came across this photo of an energy form by the wall of the tunnel. 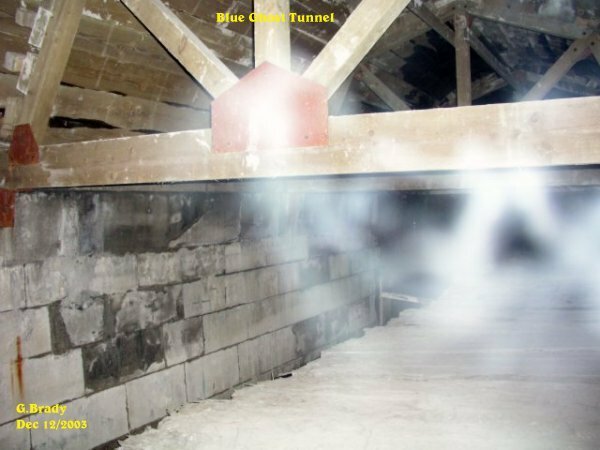 A very light blue ecto mist form was emerging from the wall to my right in this photo. I felt a slight push on my chest just before this picture was taken. 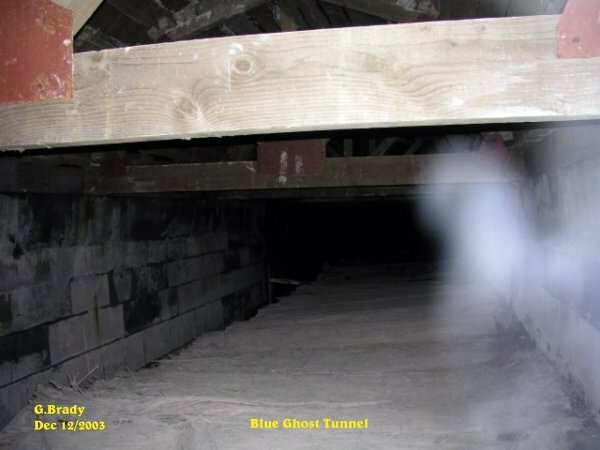 In the photo it was a strong energy form that got captured. Was this spirit trying to tell me something by pushing me? 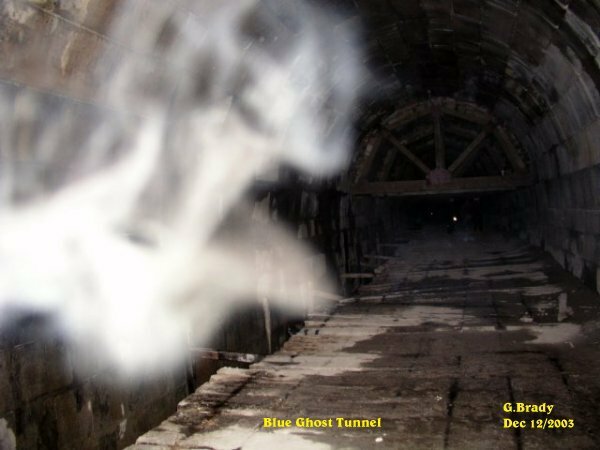 In the above photo a form was captured that almost looked like a Christmas tree within the tunnel. 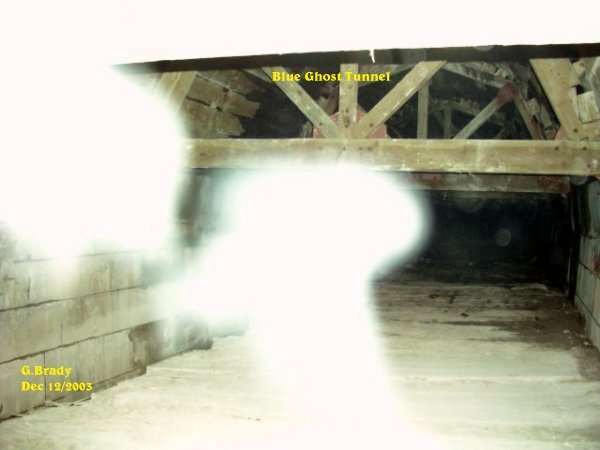 This spirit seemed to be forming into something at the time the picture was taken. This energy form was interesting in the way it seemed to bounce off the support beams by the back of the tunnel. Down at the bottom of the picture it almost looks like a little demon forming in ecto form. This photo shows some energy that seemed to be coming in from the front entrance of the tunnel. We could see movement in the tunnel all night. This was a strange energy form. Unlike most, this one seemed to have a green tint to it. 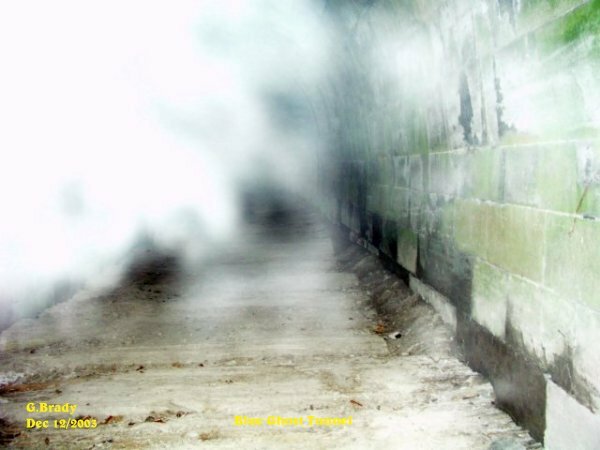 Again coming from the entrance of the tunnel some more ecto mist with a lot of energy to it streaking along the tunnel approaching us. I just got outside of the tunnel to see if anything would follow me out. Sure enough some ecto did emerge from the tunnel when I went outside. Cathy got some Ecto Plasm running along the side of the wall within the tunnel. This ecto plasm that she captured had a lot of energy to it. 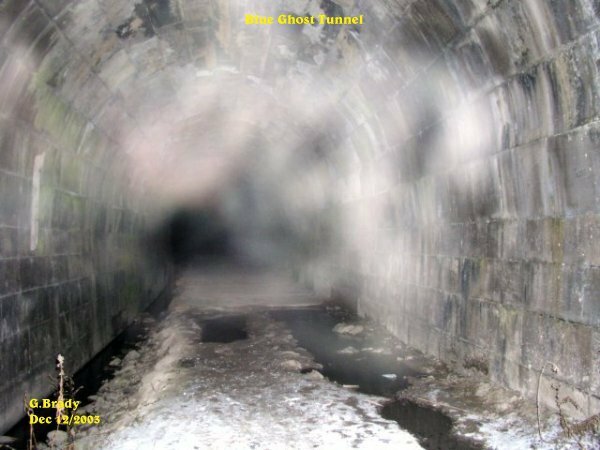 We spent about four hours there and we had got a lot more ecto pitures, but we are only showing the best ones, with interesting features to the many spirits that dwell here at the Blue Ghost Tunnel. 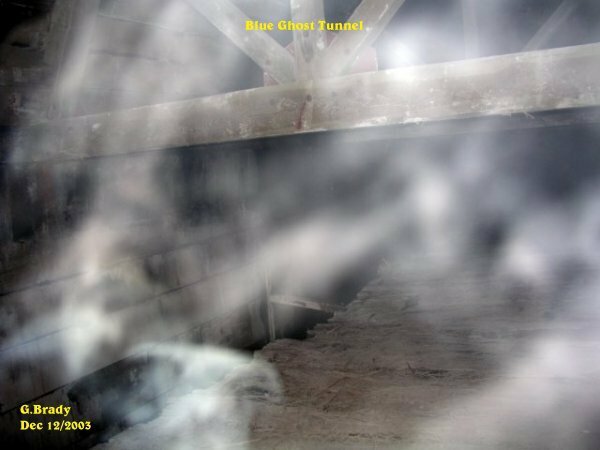 The tunnel has a lot to offer the paranormal investigator. We are sure that those that visit this place will be more than pleased with what they may find here.